Disagreements set aside for too long can calcify, and Taiwan is such an example. The fact that a phone call between US President-elect Donald Trump and Taiwanese President Tsai Ing-wen kicked up a storm highlights how frozen the differences have become. Mark Harrison, who lectures in Chinese Studies at the University of Tasmania, provides background on the relationship between Taiwan and China. After World War II, other nations took sides about whether Taipei or Beijing was capital for all of China. Governance for the two Asian tigers evolved in separate ways. 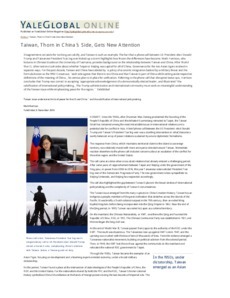 For the past decade, Taiwan and China have abided by "a policy of economic integration backed by a military threat and the formula known as the 1992 Consensus: "each side agrees that there is one China and that Taiwan is part of China while setting aside respective definitions of the meaning of China." No serious plan is in place for unification. Referring to the phone call that disrupted status quo, Harrison concludes that Trump was correct in accepting "appropriate acknowledgement of a democratically elected leader" and illustrated "the calcification of international policymaking." The Trump administration and international community must work on meaningful understanding of the Taiwan issue while emphasizing peace for the region.